Winter is my favourite season and this is partly because I love the hearty foods that it brings (that, and sweater weather). To me, a hearty stew is perfect on a cold winters day or for dinner after a long day on the slopes. Easily made in large batches, I love to freeze individualized portions to have for later. 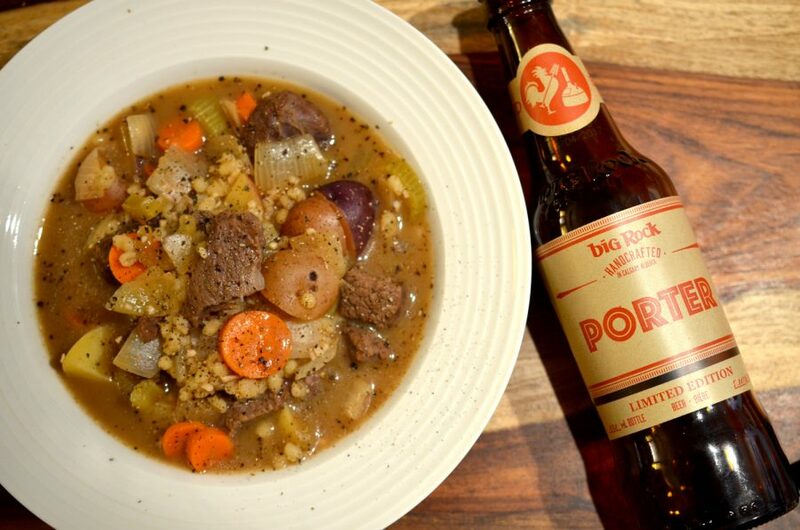 This Elk Stew pairs delightfully with the heartiness of Big Rock’s Porter (find it here) and allows for the hops to cut through the rich flavour. Rinse the elk, cute into approximately one-inch cubes and pat dry with paper towel. Season with salt and pepper on both sides. Meanwhile, heat the oil in a large pot over medium-high heat until almost smoking (very hot). Add the elk and brown on all sides, about 2 mins a side. To ensure the meat sears properly, complete browning in batches. Remove the elk from the pot to a plate once browned. Reduce the temperature to medium and add the onion, carrots, celery and garlic to the pot. Sauté briefly for about 5 minutes until the garlic is fragrant and the vegetables just start to soften. Add the remaining ingredients to the pot and scrape any brown bits off the bottom of the pan. Return elk to the pot and include any juices that have gathered on the plate. Bring pot to a boil then reduce heat to low and cover pot. Simmer for about 3 hours or until the elk is very tender.